Don't Stop Believing: New Flooring Reveal! In my six-plus years of residence in my house, I've made a LOT of improvements. But one big project has remained. After stressing about the beat-up, cat-destroyed carpet for several years, I decided to use my tax refund to get new flooring. (My philosophy is, if it's something I would have to do before listing my house, better to do it ASAP and enjoy it myself.) I also wanted to replace the kitchen/dining linoleum with tile, but figured I'd get to that later. However, when the flooring guy came to take measurements, my dad suggested I have him measure the kitchen too. The quote he gave me was reasonable and my parents generously offered to help with the expense. 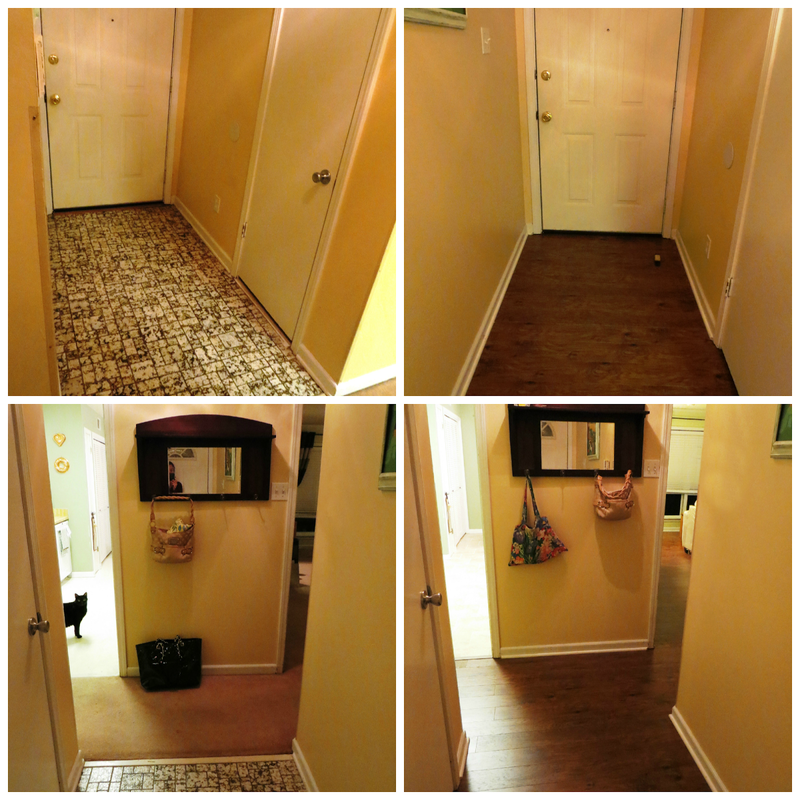 So I was able to have ALL the flooring done in one swoop! The work was done last week, and the house isn't fully back to normal yet, but I couldn't wait any longer to post Before and Afters. So here they are in all their imperfect glory! There's still work to do. I need to get a living room rug and some other things, plus this remodel has kickstarted a huge spring-cleaning and refreshing expedition. Also, one plank in the living room has done a weird popping-up thing. The workers came to look at it this morning, and apparently it's a product quality issue, so caveat emptor. In order to replace it, they'll have to re-do a big section of the room. *facepalm* Hopefully it won't be a huge deal. Looks great! It's funny how just changing one aspect of something can bring new life into it! It is beautiful! I love all the different ways that Gandalf pops up, too! How wonderful. I love the updates to your home. You must, too! God bless. Awesome! :) Don't you just love it when you make a home improvement that makes you *love* being at home. It looks so nice...def somewhere you would be comfy and want to hang out. Oh, it looks great! Your house is beautiful! I love that white shelf over the mantel, too. The floors look so good - and I'm sure they look even better in person! Really you blog have very interesting and very valuable information about the flooring keep posting more good and helpful information like this. I have bookmarked this site and just loved the content. It looks beautiful. I really like the color and texture of the wood. We are certainly hoping to make our decision soon and your information really helps!! Everything looks beautiful!